So here it is: my girlfriend’s Kappa. 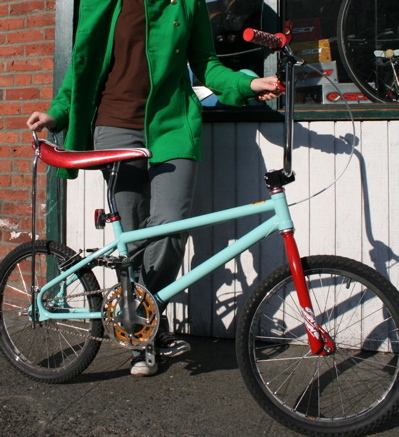 It started out as a retro-style BMX frame with modern geometry and tubing diameters, and then with Jeremy Sycip’s help I devolved the bike back into BMX’s genesis, the Schwinn Stingray. Everyone who sees knows it’s something cool, but they don’t know what it is exactly. 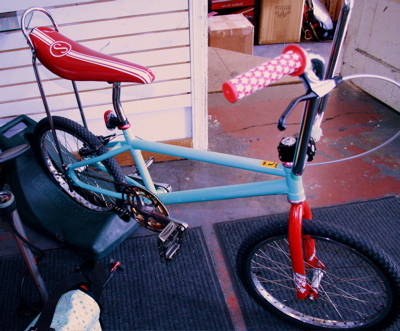 I stripped the best components off of my discarded BMX bike and put them on her bike. Now it has Shimano DXR hubs and brake lever, XTR M952 v-brake, and a Dura-Ace bottom bracket. 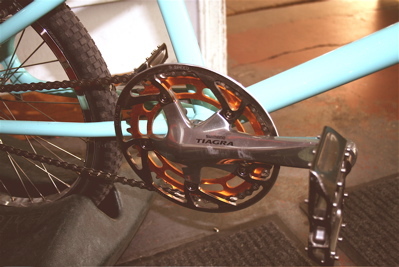 The crank is actually the Tiagra triple road crank that I used on my travel bike when I toured Japan last summer. I put an old school Shimano BMX 44-tooth chainring on, the only real vintage part on the bike. Rather than being four decades old, the Apple Krate saddle is actually a Schwinn factory repro, but it really makes the bike visually pop. Now that the bike has braze-ons for the sissy bar, the seat is secured a bit better. The last touch is the Dimension “star” grips and a chainring guard that I made by griding off the teeth from a 53 tooth Vuelta road ring. I’m not entirely happy with the fork. Someday I might send it to Sycip to have brake bosses brazed on to it and then powdercoated to match the frame, but that’ll have to wait. I told my girlfriend she needs to ride it a lot first, then we can talk about more mods. So far, she’s been riding everyday to work with it.